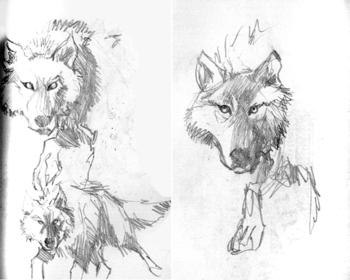 Some pretty cool wolves from my sketchbooks. What’s that you say? There’s no wolves in Journey into Mohawk Country? You’re right. I had really wanted to put some in, but couldn’t find a place. I practiced drawing them a lot, though, just in case. These are really good...the eyes of the wolf to the right are just perfect. Too bad wolves couldn't be worked into the story.